Back pain is more common in people who are overweight or obese. This is because the lower back, known as the lumbar region, supports the weight of the whole of the upper body, and gaining weight, as well as putting an extra strain on the knee and hip joints, can increase the burden on the lumbar region. This puts additional pressure on the bones, joints, muscles, ligaments and tendons of the back. Long-term, the extra weight can damage the discs between the vertebrae, the bones that make up the spine, can cause the spine to develop an unnatural curve, and can worsen the bone damage in osteoporosis (see ‘Osteoporosis and Back Pain’) and osteoarthritis (see Spinal Arthritis’). Weight gain can also have an affect on posture. These factors can cause, or worsen, chronic (long-term) back pain. 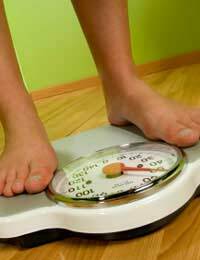 Weight gain can also make it harder to carry out the core strength and flexibility exercises that can ease back pain. Losing weight (even just 10% of body weight) can take the strain off the back, and off all of the other joints in the body, but it is important to lose weight slowly and safely. The best way to do this is by eating healthily with a wide range of fruit and vegetables, complex carbohydrates such as brown rice and wholegrain bread and pasta, and low fat sources of protein such as eggs, lean meat, fish, grains and pulses, and cutting down on sugar, alcohol and processed and high fat foods. Eating healthily doesn’t mean never having a drink or a dessert ever again, but these should be kept for treats. Losing weight also has other benefits, reducing the risk of heart disease, diabetes and certain cancers, as well as potentially helping with confidence. It’s important to make sure that the diet changes are gradual and long term – crash diets are not a healthy way to lose weight, and weight lost at a healthy rate (1-2 pounds a week) is more likely to stay off long term. Joining a weight loss group like Slimming World or Weight Watchers can help some people lose weight. It’s always best to seek a doctor’s advice before starting a new weight loss programme. Exercise helps with weight loss, and can also help to keep the back mobile (see the ‘Exercise for Back Pain’ section). It’s important to exercise carefully to avoid further damage to the back. Exercises such as swimming and other water-based exercise, walking, cycling, yoga, Pilates, aerobics and exercise ball-based training can help with both weight loss and back problems, but ensure that the class teacher is aware of any back injuries or back pain. Not all exercises are good for people with back pain, such as golf, weight lifting and body building (see’ Exercises to Avoid When You Have Back Pain’). People with back pain should talk to a doctor before starting an exercise class or beginning a new type of exercise programme.